The word فَٱلۡمُغِيرَٲتِ really means already hovering over the enemy and ready to pounce on the enemy. It is from the word أغار which means attack. صُبۡحً۬ا – at dawn time. Notice the letter nun at the end of the feel athar? This is nun niswah indicates that the doer is jama’ muanath. This jama’ muanath referes to the horses or the mares which is the favourite horse in battle. But نقع actually means the trail dust that rises due to movement in high speed. So continue to imagine as we go along the verses just like what the quraysh who are listening to these verses would have. Again, notice the letter nun at the end of the wasat? Again this is nun niswah indicating jama’ muanath. So you can imagine that the horses entered into the middle of the enemies they are attacking. By verse 5, the imagination has reaches to its peak of a battle scene, when the group of fearless attackers on their horses charging towards the enemy area with their loyal horses. In the midst of the darkness of dawn and in the cloud of dust, who is to know what awaits them at the end. Are the enemies ready for them? Will there be rows of spears awaiting them? What will happen in this battle? Then the soorah continues with asking the listener to imagine, by the sheer speed and strength of the horse, the hooves strike sparks of fire onto the ground. This is most likely caused by the horseshoe nailed onto the hooves. A horseshoe, normally made of metal, designed to protect a horse’s hoof from wear and tear. Shoes are attached on the palmar surface of the hooves, usually nailed through the insensitive hoof wall that is anatomically akin to the human toenail, though much larger and thicker. However, there are many cases where shoes are sometimes glued. 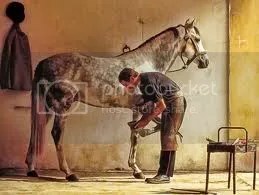 The fitting of horseshoes is a professional occupation, conducted by a farrier, who specializes in the preparation of feet, assessing potential lameness issues, and fitting appropriate shoes, including remedial features where required. 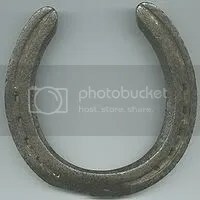 Horseshoes are available in a wide variety of materials and styles, developed for different types of horse and for the work they do. The most common materials are steel and aluminum, but specialized shoes may include use of rubber, plastic, magnesium, titanium, or copper. Steel tends to be preferred in sports where a strong, long-wearing shoe is needed, such as polo, eventing, show jumping, and western riding events. Aluminum shoes are lighter, making them common in horse racing, where a lighter shoe is desired. Since the early history of domestication of the horse, working animals were found to be exposed to many conditions that created breakage or excessive hoof wear. Ancient people recognized the need for the walls (and sometimes the sole) of domestic horses’ hooves to have additional protection over and above any natural hardness. An early form of hoof protection was seen in ancient Asia, where horses’ hooves were wrapped in rawhide, leather or other materials for both therapeutic purposes and protection from wear. Imagine the scene of the horses running at full speed towards the enemy area. You can hear the panting of their breath when they run. But otherwise they are silent for these are Arabian Mares who work in stealth. They await the commands of their master and ready to charge into the unknown territory of the enemies. They run at full speed and strength that sparks flicker at the strike of their hooves. It is dawn, when there is little light and the world is still asleep. The air still moist due to the dew dampens the dust. The speed of the running raises the dust in cloud surrounding them for a while. Then without fear, they charged into the midst of foe. The first five verses of al Adiyyat, demand the listener to imagine a battle scene. 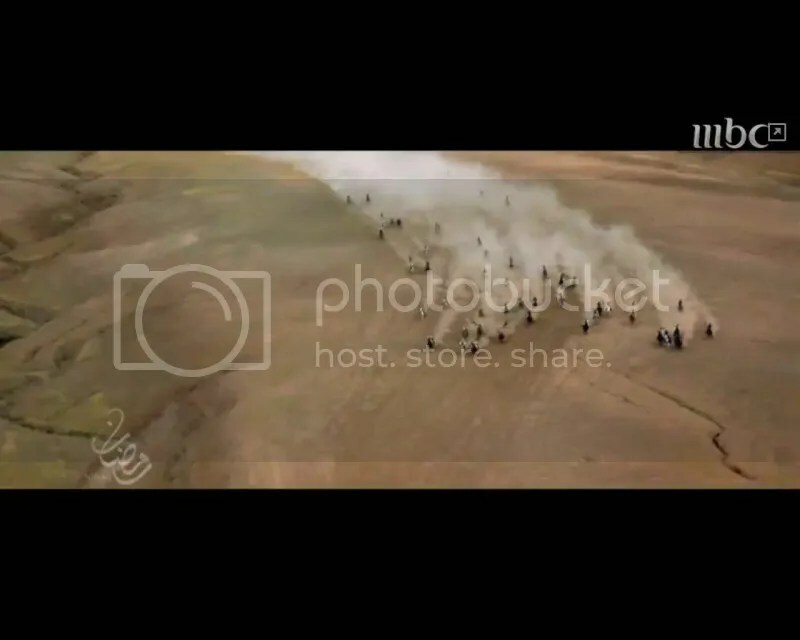 A scene that is most common to the Arab, the people who love their horses and understand battles. Surely they would be attracted to listen to the surah further. In the first ayah, Allah describes the horses of the battles as females. As we have learnt, the Arabs put high value on the mares (female horses) particularly so during their battle due to their ability to move in stealth, their speed and agility, their loyalty and courage. Moving at speed in animosity. According to linguists, the word ضبحا is rarely used for horses, but rather it is usually used on wolves. So the image that one would draw is a pack of war styled horses ready to devour its enemy which they have the certainty that they will overpower them. By the (steeds) that run, with panting. And scouring to the raid at dawn. And that which is in the breasts (of men) is made known? Verily, that Day (i.e. the Day of Resurrection) their Lord will be Well-Acquainted with them (as to their deeds and will reward them for their deeds). Let us take a look at the first five verses. Allah begins this surah with a qasm yaani Allah is taking an oath. And these five ayats are Allah’s oath. Name other surahs that you know where Allah swears? Allah makes an oath to get your attention because He is going to say something important. Thus Allah makes an oath on subjects that are important to the listener (at that time the pagan Quraysh). 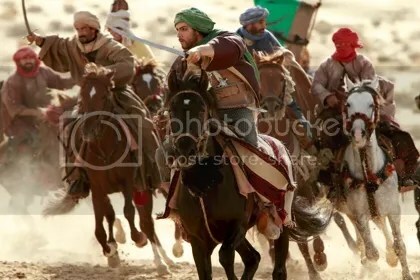 Among the things that are important to the arabs are horses especially battle horses. And Allah presented this arrangement of ayat as a scene of battle which would call the attention of the pagans who like horses and who enjoys poetry and have high interest in battles. This surah starts with describing battle horse and the scene of battle. You must run up your imagination high and brace yourself in these five first ayat. Indeed the Quran is eloquent. And Quran is send down not for entertainment but as a reminder to all. Before we continue with the tafseer of the ayat, let us look into the matter of horses of the arabs particularly the Arabian horses. Perhaps it can shed us some understanding of the importance of them and Insya Allah a higher understanding of the verses. The Arabian or Arab horse (Arabic: الحصان العربي ‎) is a breed of horse that originated from the Arabian Peninsula. With a distinctive head shape and high tail carriage, the Arabian is one of the most easily recognizable horse breeds in the world. A bulging head also known as jibbah is to be sought for and considered as a blessing to the horse. The great arching neck with a high crest, the “Mitbah” was a sign of courage, while a gaily carried tail showed pride. These traits were held in high esteem and selectively bred for. – Heads that have more distance from the eye to the top of the skull than from eye to eye across the face. – The top of the skull is in line with the eye and nostril, not bending backwards above the eyes. – The bones of the lower jaw taper from jawl to incisor. – Eyes that fill their sockets. – Unobstructed breathing represented by a well defined trachea/esophagus leading to widely spaced jowls. – A definite break in the outline between the neck and withers. – Withers slightly higher than croup. – Relatively short, strong backs. – The base of the dock of the tail is set from the point of the buttocks. – The deepest point of the body is between the forelegs. – A noticeable girth groove. – The ratio of trunk and foundation strength to height at the withers is a lower number in Desert Breds than in other Arabians. – Exceptionally well shaped hooves and sound legs. – Thin skin and a noticeable bloom to the coat. – An overall appearance of a finely tuned athlete. It is one of the oldest breeds, with archaeological evidence of horses that resemble modern Arabians dating back 4,500 years. Throughout history, Arabian horses spread around the world by both war and trade, used to improve other breeds by adding speed, refinement, endurance, and strong bone. Today, Arabian bloodlines are found in almost every modern breed of riding horse. For centuries, The Arabian developed in a desert climate and was prized by the nomadic Bedouin people. Only horses with a naturally good disposition were allowed to reproduce, with the result that Arabians today have a good temperament that, among other examples, makes them one of the few breeds where the United State Equestrian Federation rules allow children to exhibit stallions in nearly all show ring classes, including those limited to riders under 18. This selective breeding for traits including an ability to form a cooperative relationship with humans created a horse breed that is good-natured, quick to learn, and willing to please. The Arabian also developed the high spirit and alertness needed in a horse used for raiding and war. This combination of willingness and sensitivity requires modern Arabian horse owners to handle their horses with competence and respect. The desert environment required a domesticated horse to cooperate with humans to survive. Humans were the only providers of food and water in certain areas. Arabian horses needed far more water than camels in order to survive (most horses can only live about 72 hours without water). Where there was no pasture or water, the Bedouin fed their horses dates and camel’s milk. The desert horse needed the ability to thrive on very little food, and to have anatomical traits to compensate for life in a dry climate with wide temperature extremes from day to night. Weak individuals were weeded out of the breeding pool, and the animals that remained were also honed by centuries of human warfare. The Bedouin way of life depended on camels and horses. The Arabian horse was primarily an instrument of war, as were horses in general in most societies of the time. They were bred to be war horses with speed, endurance, soundness, and intelligence. A well mounted Bedouin could attack an enemy tribe and capture their herds of sheep, camels and goats, adding to the wealth of their own tribe. Because many raids required stealth, mares were preferred over stallions as they were quieter, and therefore would not give away the position of the fighters. A good disposition was also critical. The best war mares exhibited great courage in battle, taking the charges and the spear thrusts without giving ground. The highly prized war mares were often brought inside family tents to prevent theft and for protection from weather and predators. Thus they become close to the children and everyday family life. Though appearance was not necessarily a survival factor, the Bedouin bred for refinement and beauty in their horses as well as for more practical features. The value placed upon the mare led inevitably to the tracing of any family of the Arabian horse through her dame. The only requirement of the sire (male parent of a horse) was that he be “Asil”. Asil means pure blood and cross-breeding with a non-asil was strictly forbidden. Mares were the most valued, both for riding and breeding, and pedigree families were traced through the female line. The Bedouin did not believe in gelding male horses, and considered stallions too intractable to be good war horses, thus they kept very few colts, selling most, and culling those of poor quality. If his dam (Female parent of a horse) was a “celebrated” mare of a great mare family, so much the better. For centuries, the Bedouin tracked the ancestry of each horse through an oral tradition. Mare families, or strains, were named, often according to the tribe or sheikh who bred them. The Bedouins have generally been credited with the beginning of selective pure breeding of Arabian horses. These tribes, although their breeding records were kept by memory and passed down through the ages verbally, are also credited as the first to keep breeding records and maintaining the purity of the Arabian breed. To this date, many Arabian pedigrees can be traced to desert breeding meaning there is no written record but because of the importance of purity to the Bedouins, “desert bred” is accepted as an authentic verification of pure blood for those early imports. Over time, the Bedouin developed several sub-types or strains of Arabian horse, each with unique characteristics, and traced through the maternal line only. According to the Arabian Horse Association, the five primary strains were known as the Keheilan, Seglawi, Abeyan, Hamdani and Hadban. Carl Raswan, a promoter and writer about Arabian horses from the middle of the 20th century, held the belief that there were only three strains, Kehilan, Seglawi and Muniqi. Raswan felt that these strains represented body “types” of the breed, with the Kehilan being “masculine”, the Seglawi being “feminine” and the Muniqi being “speedy”. There were also lesser strains, sub-strains, and regional variations in strain names. Therefore, many Arabian horses were not only Asil, of pure blood, but also bred to be pure in strain, with crossbreeding between strains discouraged, though not forbidden, by some tribes. Purity of bloodline was very important to the Bedouin, and they also believed in telegony, believing if a mare was ever bred to a stallion of “impure” blood, the mare herself and all future offspring would be “contaminated” by the stallion and hence no longer Asil. Any mixture of foreign blood from the mountains or the cities surrounding the desert was strictly forbidden. While other, desert type breeds developed in North Africa and the periphery of the Great Desert, they were definitely not of the same blood as Arabians and were disdained by the proud Bedouin. The horse of the desert had established himself as a necessity for survival of the Bedouin people. The head men of the tribes could relate the verbal histories of each family of horse in his tribe as well as he could each family of Bedouin. 1. Allah has created the Arabian horses with many distinctive features. 2. The distinctive features gives an overall beautiful physiques of the horse, but most importantly Allah has created it to have speed, endurance and athletic. 3. To top it Allah created the Arabian horses to be intelligent, quick in learning, very alert and good natured. 4. The nature of the desert made the horses very dependent on its master for food and water and also shelter. Thus when treated right, they are very trusting, loyal and obedient to its master. 5. It being good natured and mildness makes it a very suitable family horse especially among children. 6. It being created as intelligent, quick in learning and alertness and top with it speed and endurance made it the most suitable horse for war especially in the desert world. 7. The most prized Arabian horse is the Arabian mares. 8. The distinct feature of an Arabian mare is it is quieter compared to the stallion which is an advantage for the attacker to move in stealth when attacking an enemy. 9. The Arabian mares also exhibit great courage in battles. 10. The strain family line (genealogy) of an Arabian horse is identified through its maternal lines. 11. In the arab culture, crossbreeding an Arabian horse with another is strictly forbidden. Also forbidden is crossbreeding between strains. 12. Arabian horses are the most versatile breed. It now dominates the discipline of endurance riding and many equestrian activities.